Finally, we have meaningful baseball games to discuss. In what felt like an eternity of a wait, one of my favorite day of the year returned, Opening day. Despite the long odds Vegas may be giving your team to win the World Series, none of that matters on opening day. Every team gets a fresh start and every fan believes this will be “the year” for their team. In New York we are looking at two teams going in different directions. We have the aging Yankees, who look to prove naysayers wrong, in that they are not an overall the hill bunch. There opening day lineup was far from intimidating, as they are dealing with a list of perinatal All-Stars , Jeter, Arod, Texeria and Granderson on the disabled list. Then we have the Mets, who’s roster is filled with players that may leave some fans asking “Who are these guys?“. The two teams couldn’t of gotten off to completely different starts, the Yankees dropped their home opener to lifetime rival, Boston Red Sox, 8-2, while the Mets won in blowout fashion, with an 11-2 victory over the Padres. The Yankees struggles began with C.C. Sabathia. He has a reputation for getting off to slow starts in April and May, and he showed no signs of that changing this year. Sabathia allowed all four of his runs in the second inning. 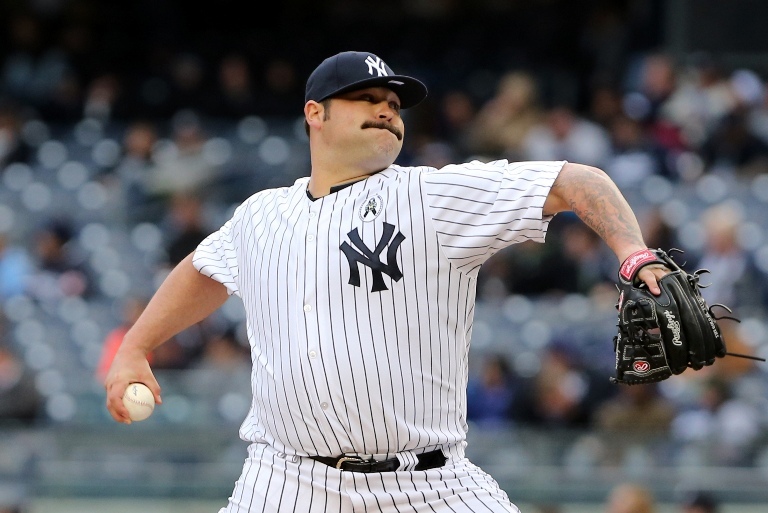 Although he settled down, He was only able to last five innings on the day, not what the Yankees were looking for out of their ace. Francisco Cervelli did cut with a two run single, but that would be all the offense they would get. The bullpen went on to allow four more runs, three of which were given up by Joba Chamberlin. I’m not sure if I was more disturbed by how ineffective he was or that mustache. This was obviously not the start the Yankees were hoping to get off too. The offense, will have to play a different style of baseball than fans have been accustomed to in recent years. This team will not be breaking any home run records, if they want to keep it together while they wait for the Calvary to arrive, they must learn to play a form of small ball. Most importantly, with the amount of injuries hurting their line up, it will be extremely important for the pitching staff to carry the load these next few weeks to keep them in ball games. Mets fans are happy, as they sit atop the NL East, even if its only for today. They couldn’t of asked for a much better start yesterday. Jonathon Niese went 6 2/3’s strong, allowing only two runs, showing early signs that this could be a break out season for the left hander. What I enjoyed most about his start, was how he fought with Terry Collins to remain in the game heading into the 7th. It’s that type of attitude this team has lacked in years past and can only hope will spread among the rest of the roster. The bats were alive yesterday as they recorded 13 hits on the day. Colin Cowgill, Daniel Murphy, Marlon Byrd, John Buck and Jon Niese all recorded two hits. The biggest hit of the day, came off the bat of Cowgill, who hit a grand slam in the 7th to cap off the day in the 11-2 win. The outfield is the biggest question mark coming into the season, which made is all the more important for Cowgill and Bryd to make an early impact. There wasn’t anything to complain about from a Mets standpoint yesterday, it will just be a matter if these journeyman players can continue to produce along with the young players progressing as the year goes on. All in all, it is just one game for both the Mets and Yankees. For the moment, it has Yankee fans wondering if this is a sign of things to come and Met fans hoping they can pull off another Miracle year, only time will tell. Robinson Cano Leaves Scott Boras, Signs with Jay-Z. Wait, What?